THERE IS A CREATION OF THE SHERLOCK HOLMES’ FLAT IN LONDON, that looks to the era and also to current incarnations of the detective. The rooms are decorated with the famous pipe, violin, and scientific equipment, whilst the wall is marked with a VR (for Victoria Regina) made by Holme’s pistol shots. Plaster casts of some great bloodhound prepared by New Scotland Yard lie next to a snuff box of old gold, with a great amethyst in the centre, a gift from the King of Bohemia in connection with the Irene Adler papers. The attention to detail is remarkable, and the many screen and stage depictions of Holmes and Watson are represented with props and artwork. So lifelike is the representation of 221b Baker Street, that it feels like one has stepped back into Conan Doyle’s Victorian London. Follow Sherlock Holmes’ museum above pub and you can see a series of photos taking you through the flat (press the arrow on the right of the first picture). 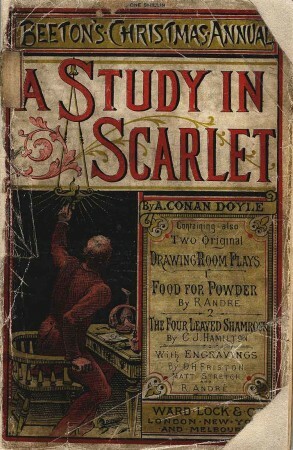 Conan Doyle’s A study in scarlett, 1887. 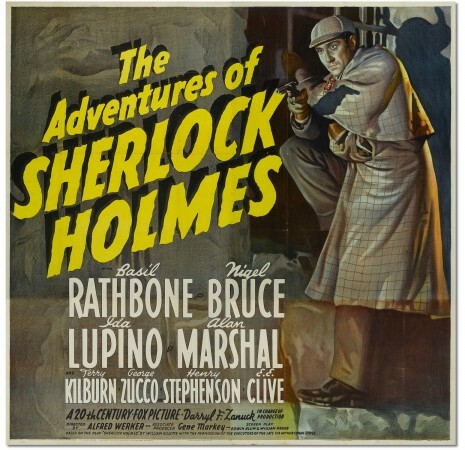 And here is an even better way to learn about Holmes’ collectables – another link to a site about Holmes’ collectables. It shows examples and prices. So snoop away. 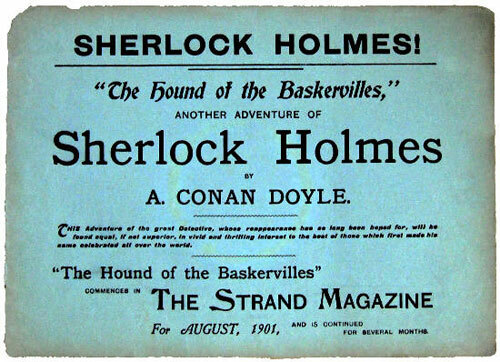 “Special Limited Edition”, dated 1903, but a later printing dating from circa 1906-1912 (as per the publisher’s address on the title page). 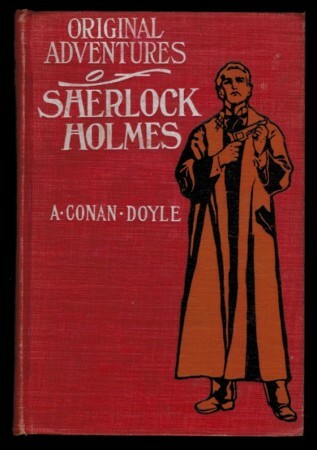 Original pictorial red cloth depicting the detective in orange and black, spine and front cover lettered in white. 431 pp + 3 pp ads at rear. Frontispiece & nine plates, all illustrations of scenes from the Gillette stage play. At least two bindings of this edition exist; this one and another with an Art Nouveau floral design on the front cover, the flowers in white and gilt. A few interior marks, spine lettering slightly effaced; a very good copy.